Fritz Lang did his best work in Hollywood throughout the 1940s, and The Woman in the Window ranks among his best films from that period. Equally adept at crafting first-rate Westerns and melodramatic thrillers, Lang returned to the latter category for The Woman in the Window, a deliciously devious follow-up to 1944’s Ministry of Fear and a near-perfect companion piece to Lang’s 1945 follow-up, Scarlet Street. Adapted by producer/screenwriter Nunnally Johnson from J.H. Wallis’s novel Once Off Guard, this briskly paced and brilliantly plotted thriller begins with a chance encounter between mild-mannered psychology professor Richard Wanley (Edward G. Robinson) and Alice Reed (Joan Bennett), the stylishly alluring subject of a portrait that Wanley has dreamily admired in a window near the men’s club where he socializes with a savvy District Attorney (Raymond Massey) and a friendly physician (Edmund Breon). When Alice invites Wanley to her apartment for casual drinks and conversation, Wanley is forced to kill an intruder, and his subsequent cover-up leads to a nail-biting plot in which Wanley must feign innocence as he “innocently” participates in the D.A.’s investigation with a homicide detective. 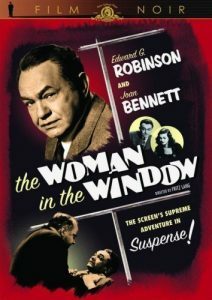 Lang was an expert at turning the screws of suspense, and while Johnson’s screenplay tempers its convenient coincidences with well-written characters, Robinson’s increasing desperation is the engine that drives the plot. When a sleazy blackmailer (Dan Duryea) squeezes Wanley and Reed for every penny they’ve got, The Woman in the Window winds up to a fever pitch, with a “twist” ending that’s either a cop-out or clever, depending on your tolerance for now-familiar surprises.